To evaluate the susceptibility rates of aerobic and facultative Gram-negative bacterial isolates from Chinese intra-abdominal infections (IAI) and urinary tract infections (UTI) focusing on carbapenems and comparing their effectiveness between 2014 and 2015. A total of 2318 strains in 2015 (1483 from IAI and 835 from UTI) and 2374 strains in 2014 (1438 from IAI and 936 from UTI) were included in the analysis. Antimicrobial susceptibilities were determined at a central laboratory using CLSI broth microdilution and interpretive standards. Hospital acquired (HA) IAI and UTI were defined as isolates sampled > 48 h and community acquired (CA) as isolates sampled < 48 h after admission. The main species derived from IAI and UTI in 2015 were Escherichia coli (50.86%) and Klebsiella pneumoniae (19.20%). Susceptibilities of Escherichia coli IAI and UTI strains to imipenem (IPM) and ertapenem (ETP) were > 90% in 2014 and 2015, while the susceptibilities to IPM and ETP of Klebsiella pneumoniae IAI strains were > 80% in 2014 but dropped to ≤80% in 2015 for UTI strains. Susceptibilities of IAI Enterobacteriaceae strains to IPM and ETP in 2015 were lowest in the colon and abscesses, and Enterobacteriaceae susceptibilities of UTI and IAI isolates to IPM and ETP were lowest in medical, pediatric and surgery intensive care units (ICUs) in 2015. IPM and ETP were effective in vitro against Enterobacteriaceae isolated from IAIs and UTIs in 2014 and 2015, but susceptibility to carbapenems in UTIs markedly decreased in 2015. The Study for Monitoring Antimicrobial Resistance Trends (SMART)-CHINA is a surveillance program which monitors annually in vitro activities of antimicrobial agents against pathogens that cause intra-abdominal infections (IAI) and urinary tract infections (UTI). In a previous Chinese study it was reported that the incidence of Extended-Spectrum β-Lactamases (ESBL)-producing Escherichia coli (E. coli) strains derived from IAI had significantly increased between 2002 and 2011, while the percentages of ESBL-producing Klebsiella pneumoniae (K. pneumoniae) strains isolated from IAI remained relatively constant between 30.1 and 39.3%, but these two species were the major pathogens during the entire period . However, Asia has been reported to have the world’s highest incidence of ESBL-producing E. coli, K. pneumoniae, Klebsiella oxytoca and Proteus mirabilis strains from IAIs and UTIs in 2011, reaching 40% to 45% , and a number of recent publications have noted that cephalosporins and fluoroquinolones were not suitable antibiotics for the empirical treatment of IAI and UTI in China [3, 4], underlining the importance of monitoring susceptibilities to alternative antibiotics such as the carbapenems. Epidemiological and individual hospital drug susceptibilities are commonly used as a guide for selecting suitable antibiotics for empirical treatments. However, susceptibility analyses have been extended to weighted-incidence syndromic combination antibiograms (WISCA), which reflects the likelihood that regimens treat all relevant organisms in a patient with a given syndrome . In the present study we developed organ-specific weighted incidence antibiograms (OSWIAs) to estimate the likelihood of an isolate from a specific organ being susceptible to a given antibiotic. IAI and UTI derived isolates and their susceptibilities to carbapenems, cephalosporins, fluoroquinolones, broad-spectrum penicillins combined with β-lactamase inhibitors, and an aminoglycoside were compared in different infected organs. In addition, the distribution of Enterobacteriaceae and non-Enterobacteriaceae infections isolated from HA and CA IAIs and UTIs in different age subgroups as well as the susceptibility patterns of major pathogens in different medical departments were also analyzed. The Human Research Ethics Committee of Peking Union Medical College Hospital approved this study and waived the need for consent (Ethics Approval Number: S-K238). A total of 2318 aerobic and facultative Gram-negative bacterial strains (1483 from IAI and 835 from UTI) in 2015 and 2374 strains in 2014 (1438 from IAI and 936 from UTI) collected from 21 hospitals in 16 Chinese cities were retrospectively analyzed. The majority of the intra-abdominal specimens were obtained during surgery, with some paracentesis specimens. The UTI isolates were obtained from clean catch midstream urine, the urinary bladder, kidney and the prostate gland. All duplicate isolates (the same genus and species from the same patient) were excluded. Bacteria were identified by standard methods used in the participating clinical microbiology laboratories. Isolates were considered to be community-associated (CA) if they were recovered from a specimen taken < 48 h after the patient was admitted to a hospital, or HA if the specimen was taken ≥48 h after admission, as previously described . Minimum inhibitory concentrations (MIC) were determined by broth microdilution according to the Clinical and Laboratory Standards Institute (CLSI)  using panels purchased from ThermoFisher Scientific (Cleveland, OH, USA). Relative susceptibility interpretations were based on CLSI clinical breakpoints . Twelve antimicrobial agents commonly used to treat IAI and UTI were tested: ampicillin-sulbactam (SAM), piperacillin-tazobactam (TZP), ceftriaxone (CRO), cefotaxime (CTX), ceftazidime (CAZ), cefoxitin (FOX), cefepime (FEP), ciprofloxacin (CIP), levofloxacin (LVX), amikacin (AMK), imipenem (IPM) and ertapenem (ETP). Reference strains E. coli ATCC (American Type Culture Collection) 25,922, Pseudomonas aeruginosa ATCC 27853, and K. pneumoniae ATCC 700603 (positive ESBL control), were used as quality control (QC) strains for each batch of MIC tests. Results were only included in the analysis when corresponding quality control isolate test results were in accordance with CLSI guidelines and therefore within an acceptable range. Weighted susceptibility of a certain antimicrobial drug in a certain organ = antimicrobial susceptibility of A × the constituent ratio of A in the organ + antimicrobial susceptibility of B × the constituent ratio of B in the organ + antimicrobial susceptibility of C × the constituent ratio of C in the organ +… (where A, B and C represent the pathogenic bacteria in a certain organ). For example when we calculated the OSWIA susceptibility of gall bladder isolates to ETP in 2015, first we extracted specific bacterial infection rates and then multiplied them by the specific bacterial susceptibilities to ETP in 2015. Isolates in 2015 from gall bladder were 241 Escherichia coli (50.1%), 87 Klebsiella pneumoniae (18.1%), 36 Enterobacter cloacae (7.5%)……until 1 Serratia odorifera (0.21%). The corresponding susceptibilities to ETP were 87.55% (Escherichia coli), 86.21% (Klebsiella pneumoniae), 66.67% (Enterobacter cloacae)……and 100% (Serratia odorifera). According to the above mentioned equation, the susceptibility of gall bladder to ETP was calculated as 50.1% × 87.55% + 18.1% × 86.21% + 7.5% × 66.67%......0.21% × 100% = 85.79%. The susceptibility of all Gram-negative isolates combined was calculated using breakpoints appropriate for each species and assuming 0% susceptible for species with no breakpoints for any given drug. The 95% confidence intervals (CIs) were calculated using the adjusted Wald method; linear trends of ESBL rates in different years were assessed for statistical significance using the Cochran-Armitage test and comparison of ESBL rates were assessed using a chi-squared test. P-values < 0.05 were considered to be statistically significant. Enterobacteriaceae strains of IAIs were mainly derived from gall bladder (33%), peritoneal fluid (28%), abscesses (14%) liver (7%), appendix (6%) and other organs (1–3%). Comparing Enterobacteriaceae strains acquired from HA (76.3%) and CA (23.6%) IAI, the percentages for peritoneal fluid, abscesses and liver-derived isolates were similar, but in HA-derived IAIs, gall bladder isolates were collected more often (35% vs 26%), whereas appendix isolates were less frequently sampled (2% vs 20%) compared to CA isolates (Fig. 1). Similar distributions were found in 2014 (Additional file 1: Figure S1). From UTI pathogens, 99.4% of the strains were acquired from urine, with only 3 strains from the kidneys, and 1 strain each from the bladder and prostate gland. The distribution of HA and CA UTI isolates was 599 (71.9%) and 234 (28.1%) in 2015, and 58.1% and 40.9% in 2014, respectively. There were 2318 strains collected in 2015, including 1483 strains from IAIs and 835 strains from UTIs. The majority of infections were caused by E. coli and K. pneumoniae, accounting for 50.86% and 19.20% in 2015 (Table 1) as well as 46.3% and 17.3% in 2014 (Additional file 2: Table S1). The distribution analysis of strains acquired from IAIs and UTIs in HA and CA in different age groups revealed that E. coli was the major IAI pathogen in CA IAI in the 0–39 year age range (CA: 31.76%; HA: 9.01%) and in HA IAI in the 60–79 years age range (CA: 32.35%; HA: 47.38%), as well as in the HA UTI of > 80 year-old patients (CA: 5.56%; HA: 18.53%) (Fig. 2), which was similar in 2014 (Additional file 3: Figure S2). E. coli in IAI were highly susceptible to IPM, AMK and ETP (> 90%) in 2014, but the susceptibility to ETP showed a small decrease in 2015 (Fig. 3a) compared to 2014. K. pneumoniae from IAI was also highly sensitive to AMK, IPM and ETP (> 80%) in 2014–2015, but the susceptibility to these three antibiotics in 2015 was generally lower than in 2014 (Fig. 3c). More than 90% E. coli isolates from UTI were susceptible to IPM, AMK, ETP and TZP. 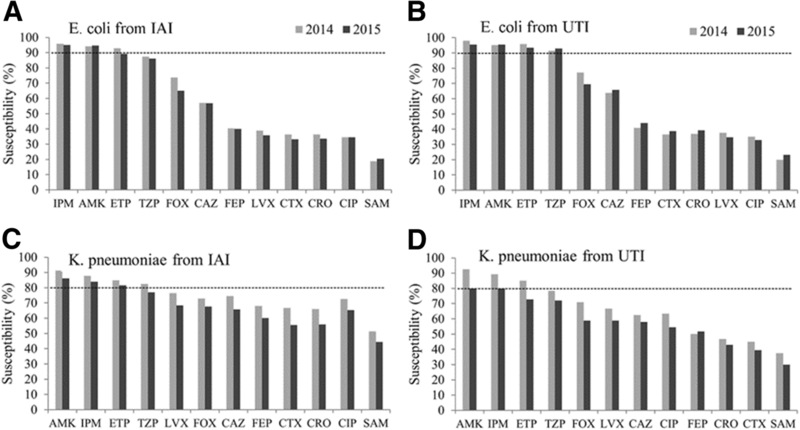 In contrast, compared to 2014 susceptibilities of K. pneumoniae strains from UTIs decreased by 10% to AMK, IPM and ETP in 2015, which was a general trend also for all the other antibiotics tested (Fig. 3d). Susceptibilities to all other antibiotics were between 20 and 70% for E. coli and 30–75% for K. pneumoniae (Fig. 3). Corresponding MIC90 values of 12 antibiotics for E. coli and K. pneumoniae IAI and UTI isolates are presented in the Additional file 4: Table S2. In general, besides abscesses and colon infections in 2015 as well as small intestine infections in 2014 to ETP, most included Enterobacteriaceae IAI isolates showed OSWIA susceptibilities to carbapenems of > 80% in 2014 and 2015 (Fig. 4a, Fig. 4b). In 2015, carbapenem susceptibility rates of Enterobacteriaceae isolated from IAIs and UTIs decreased below 80% in medical and surgery ICUs to ETP as well as in general pediatric departments and surgery ICUs in 2015 to IPM. The greatest decline in susceptibility to IPM and ETP was seen between 2014 and 2015 in pediatric ICUs (Fig. 4c, Fig. 4d). In general there was a trend of susceptibility reductions to ETP and IPM in HA, and susceptibility increases to ETP and IPM in CA-derived Enterobacteriaceae caused IAIs between 2014 and 2015 (Fig. 4e, Fig. 4f). Detailed information of MIC90 values from E. coli and K. pneumoniae for ETP and IMP in different organs, departments and HA vs CA infections in 2014 and 2015 are shown in Table 2 and indicate dramatically increased MIC90 values of IPM for E. coli isolates only in medicine ICUs in 2015, while the MIC90 values for IPM of K. pneumoniae IAI isolates from abscesses, colon, peritoneal fluid and others were all > 32 in 2015, pointing out increasing IPM resistance of K. pneumoniae infections in 2015. In addition, the MIC90 values of IPM for K. pneumoniae isolates derived from general surgery departments as well as from ICUs of medicine, pediatric and surgery became > 32 and also reflected in essentially increased HA MIC90 values (Table 2), which showed that clinical relevant resistance of IAI derived K. pneumoniae isolates to IPM appeared in hospitals in 2015. Enterobacteriaceae were the major pathogens in IAI and UTI, with E. coli and K. pneumoniae being the most commonly isolated strains, which is in accordance with recent studies in China and abroad [3, 9] . E. coli isolated from both UTI and IAI were < 40% susceptible to the tested fluoroquinolones that reflects an overuse of fluoroquinolones in China, which has also been reported for Europe and the US [11, 12]. In addition, in 2015 E. coli isolates were < 70% susceptible to all cephalosporins tested including cefoxitin whether they were obtained from IAI or UTI, suggesting a high prevalence of ESBL production, which is an extension of the trend shown previously between 2002 and 2011 . A similar but less dramatic pattern has been observed for K. pneumoniae, but in contrast to E. coli, K. pneumoniae showed a decreasing susceptibility to all tested antibiotics from 2014 to 2015 (Fig. 3). Though ESBL-producing E. coli and K. pneumoniae strains should be susceptible to cefoxitin, both species, whether found in IAI or UTI, were < 80% susceptible to cefoxitin, which suggests that besides ESBL production other resistance mechanisms may be on the rise . In particular K. pneumoniae showed a decreasing susceptibility to carbapenems, which was more pronounced in UTI isolates and indicated that carbapenemases or other mechanisms of carbapenem resistance have developed in K. pneumoniae strains, which has also been previously noted since carbapenem resistant K. pneumoniae strains isolated in Shanghai between July 2014 and May 2015 harbored all or at least one of the ESBL genes plus mainly New Delhi metallo-β-lactamase-1 (NDM-1) and IMP-4 or Klebsiella pneumoniae carbapenemase (KPC)-2 . 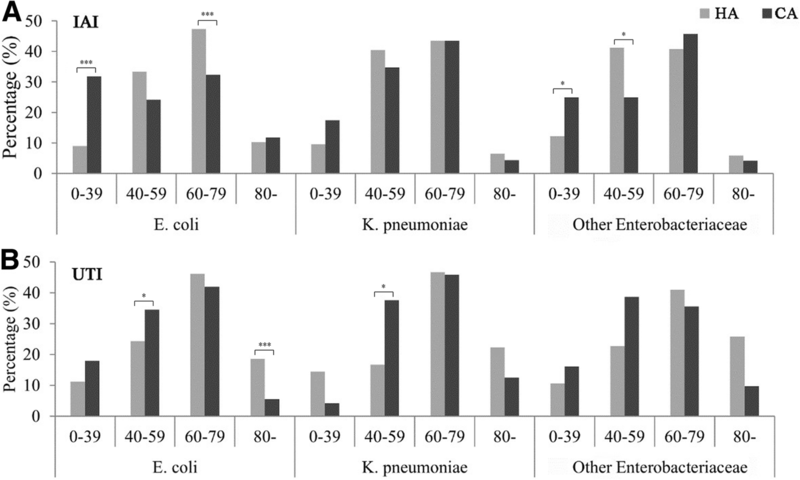 However, data from 2015 showed K. pneumoniae IAI isolate susceptibilities between 80 and 90% to IPM and ETP in our study, which was much higher than the 43.24% susceptibility to IPM reported for K. pneumoniae IAI isolates from a Chinese tertiary-care hospital between 2012 and 2015 , but was in a similar range to Chinese isolates from abdominal trauma-associated IAI collected between 2010 to 2015, with susceptibilities of K. pneumoniae strains to IPM and ETP of 87.5–90.6% . The distribution of Enterobacteriaceae IAI isolates were similar in peritoneal fluid, abscesses and the colon for HA and CA infections, but HA IAIs manifested more in the gall bladder whereas CA infections occurred to a greater extent in appendicitis IAIs in 2015 (Fig. 1), which is a fair finding since acute appendicitis is a common reason for hospital admissions worldwide . In particular, colon IAI-derived strains showed an increased resistance to carbapenems, decreasing to 80% susceptibility to ertapenem and imipenem in 2015. Similarly, IAI strain susceptibilities from abscesses were about 80% to carbapenems in 2015, but the decrease compared to 2014 was less pronounced (Fig. 3). Apart from general pediatric departments, in 2015 lowered susceptibilities particularly to IPM were most obvious in ICUs, which is in agreement with previous studies, in which it was noted that patients infected with carbapenem-resistant K. pneumoniae strains were mainly elderly, possessed multiple co-morbidities, were frequently admitted from and discharged to post-acute care facilities, and experienced prolonged hospital stays . In addition, for carbapenem-resistant Gram-negative pathogen infections, previous administration of carbapenems has been shown to be a major factor, particularly in ICUs , and isolation of patients harboring carbapenem-resistant Enterobacteriaceae and delayed application of alternative antibiotics has been proposed to lead to a spread of these pathogens in ICUs . A limitation of the present study is the missing data about molecular mechanisms of resistances against the included antibiotics. Susceptibilities of E. coli IAI and UTI strains to IPM and ETP were > 90% in 2014 and 2015, while susceptibilities to IPM and ETP of K. pneumoniae IAI strains were > 80% in 2014, but decreased to ≤80% in 2015, particularly for UTI strains. Susceptibilities of all IAI Enterobacteriaceae strains to IPM and ETP were lowest in the colon and abscesses and Enterobacteriaceae susceptibilities of both UTI and IAI isolates to IPM and ETP were lowest in medical, pediatric and surgery ICUs in 2015. Susceptibilities rates of E. coli and K. pneumoniae strains to cephalosporins collected from UTIs ranged from 38.6 to 69.5% and for IAI strains from 33.18 to 67.7% in 2015, which suggests that cephalosporins should not be the first choice for empirical UTI and IAI antibiotic therapy. This research was supported by Outstanding Talents Training Funding Project of Dongcheng District, Beijing (2017), The National Key Research and Development Program of China (SQ2018YFC120102), CAMS Innovation Fund for Medical Sciences (CIFMS) (Grant no. 2016-I2M-1-014) and CAMS Initiative for Innovative Medicine (Grant no. 2016-I2M-3-014). This study was supported by funding from Merck Sharp & Dohme (MSD; Whitehouse Station, NJ, USA). All authors have read and approved the manuscript. The authors were solely responsible for the conception and performance of the study and for writing this manuscript. Conceptualization: HZ, YXN, QWY, YCX. Data collection: HZ, HSK, YSY, AHW, QD, XFJ, SFZ, ZYS, YXN, WPW, YW, KL, HYL, CXY, WXH, BDG, BS, RB, QWY, YCX. Data analysis: HZ, YSY, AHW, QD, SFZ, BDG, WPW, RB, QWY, YCX. Writing original draft: HZ, YCX. Writing review & editing: HZ, HSK, YSY, AHW, QD, XFJ, SFZ, ZYS, YXN, WPW, YW, KL, HYL, CXY, WXH, BDG, BS, RB, QWY, YCX. The Human Research Ethics Committee of Peking Union Medical College Hospital approved this study and waived the need for consent (Ethics Approval Number: S-K238). Robert Badal received financial support in the form of salaries from International Health Management Associates, who receive funding from MSD to administer the SMART program and for SMART-related travel and consultation expenses.